ABC's "The Bachelor" ended its season on a strong note Monday, rising vs. its year-ago finale in several categories and dominating all programs on the night in the younger half of the key 18-49 demo. NBC's "The Voice" still emerged as the No. 1 series of the night in broad categories, and its "Blindspot" held steady despite tougher competition to stand as top dog in demos among scripted shows. Looking at the preliminary national estimates from Nielsen, ABC won Monday in adults 18-49 behind the two-hour season finale of "The Bachelor" (2.8 rating/9 share in adults 18-49, 9.5 million viewers overall) and the post-game special "The Bachelor: After the Final Rose" (2.7/9 in 18-49, 9.2 million viewers overall). The two-hour main finale matched last year's 18-49 rating, and appears poised to out-rate it in the final nationals due this afternoon from Nielsen. For the night, the Alphabet was up a tick vs. last year in both adults 18-49 (2.8 vs. 2.7) and 18-34 (2.6 vs. 2.5) for its best Monday averages in two years (since the March 2014 finale of "The Bachelor"). THE BACHELOR - 'Episode 2010' - The compelling live three-hour television event will begin with America watching along with the studio audience as Ben Higgin's journey to find love comes to its astonishing conclusion. The Bachelor prepares to make one of the most difficult choices of this life, having narrowed down the field to two women - Jo Jo and Lauren B.- both of whom he told that he loved them. Who does Ben, after much soul-searching, see as his future wife? 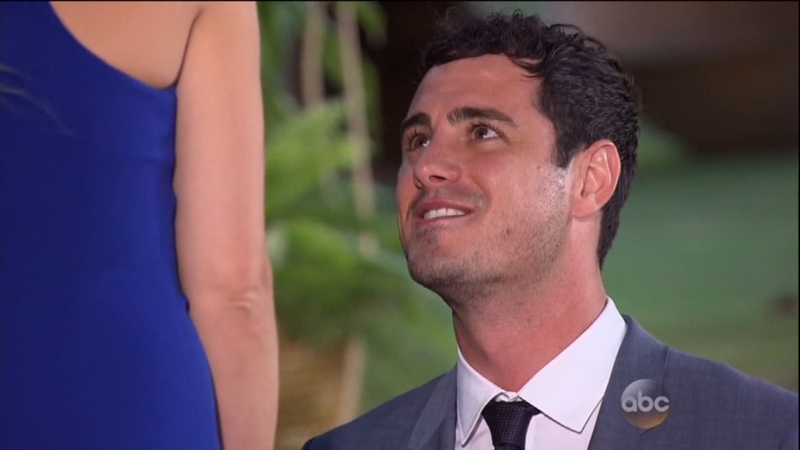 Find out on the season finale of 'The Bachelor,' MONDAY, MARCH 14 (8:00-10:01 p.m. EDT), on the ABC Television Network. (Photo by Matt Dunn/ABC via Getty Images)'nLAUREN B. THE BACHELOR - 'Episode 2005' - The first international stop of the season finds Ben and the 11 remaining bachelorettes traveling to Mexico City, one of the largest metropolitan areas in the world. Amanda has a thrillingly romantic one-on-one date with Ben, soaring over ancient ruins in a hot-air balloon. The women will attempt to learn Spanish with Ben but they immediately need to use their new-found knowledge to go shopping for a cooking competition. Lauren H. has a spring in her step as she and Ben walk the runway with top models during for Mexico City's Fashion Week. One heart-wrenching confrontation between Ben and one unhappy bachelorette changes the course of Ben's journey to find love. The women decide to take matters into their own hands and corner Ben about Olivia's bad behavior. Will the Bachelor decide it is time for her to pack her bags? 'The Bachelor' airs MONDAY, FEBRUARY 1 (8:00-10:01 p.m. EST) on the ABC Television Network. (Photo by Eniac Martinez/ABC via Getty Images) CHEF LULA MARTIN DEL CAMPO, CHEF NICOLAS MARTIN DEL CAMPO, LAUREN B. Perhaps most telling was dominance among the 18-34 crowd for "The Bachelor" (2.7/11) over "The Voice' (1.8/7), with its 50% margin of victory up significantly over last year's 4% edge (2.6 vs. 2.5). "The Voice" still prevailed head to head in most other categories, including by 7% in 18-49 (3.0 vs. 2.8) 21% in adults 25-54 (4.1 vs. 3.3) and by 28% in total viewers (12.2 million vs. 9.5 million). "The Bachelor" has been a shining light for ABC during what has otherwise been a rough winter ratings-wise. The program also continues to be an attractive option for advertisers, ranking No. 4 among all primetime broadcast series — and the No. 1 reality program — among adults 18-49 living in homes with $100,000+ annual income. According to Nielsen estimates prior to last night's finale, only "The Big Bang Theory," "Modern Family" and "The X-Files" rank higher on this list. The 10 p.m. "After the Final Rose" special, in which host Chris Harrison revealed the name of this summer's leading lady on "The Bachelorette," dominated its time period. In 18-49, it beat NBC's "Blindspot" by 59% and CBS' "NCIS: Los Angeles" by 108%, and it also led all networks at 10 p.m. in total viewers. Despite the week-to-week gains for ABC (up 56% in 18-49), NBC's "The Voice" (3.0/10 in 18-49, 12.2 million viewers overall) and "Blindspot" (1.7/5 in 18-49, 6.5 million viewers overall) held up well. Despite the start of Daylight Saving Time and the tougher "Bachelor" competition, "The Voice" was within 6% of last week's average, while "Blindspot" retained 100% of its week-ago score. "Blindspot," whose last week's episode grew in Live+3 by 64% in 18-49 rating (1.71 to 2.80) and by 3.5 million total viewers (6.6 million to 10.1 million), could gain even more this week since it aired opposite the "After the Final Rose" special, which is a big live draw. Elsewhere, Fox's tandem of "Gotham" (1.3/5 in 18-49, 4.0 million viewers overall) and "Lucifer" (1.2/4 in 18-49, 3.9 million viewers overall) fell to season lows, as did CBS' "Supergirl" (1.3/5 in 18-49, 6.6 million viewers overall). CBS' "Scorpion" matched its season low (1.5/5 in 18-49, 8.8 million viewers overall), but the net's "NCIS: Los Angeles" (1.3/4 in 18-49, 8.7 million viewers overall) was up a tick over its prior original of two weeks ago. CW aired repeats of "Crazy Ex-Girlfriend" (0.2/1 in 18-49, 0.7 million viewers overall) and "Jane the Virgin" (0.2/1 in 18-49, 0.5 million viewers overall).